Thinking and trying to understand and write about (as well as talk about) violence in children is a challenging, and at times disturbing endeavour. The writing and editing of this book thus entailed a similar challenging process. The challenge however became a rewarding experience, as the knowledge I gained from the research, the writing and the editing was essential to my own attempts to understand violence in children. This book took a long time to write and entailed digesting a lot of different thoughts and emotional experiences. I could say that the process of writing this book had similar features to the therapeutic process between a psychotherapist and a child that is involved in some form of violence. The therapeutic process is not always easy, it takes time and a lot of thought and as such needs to rest firmly on being able to contain, understand, think, feel and talk about some very painful and often disturbing experiences. The therapeutic process is also rewarding. Working with and trying to help the child that harms is work that has to be done with a good, solid knowledge base as well as good, solid support and supervision. This book provides the former - a good base from which to start understanding how children can become violent. As you read this book you will understand how children that become involved in violence need very specific, specialised types of interaction and communication with a responsible thinking and feeling adult and/or psychotherapist. Often the child who is violent is not able to find words or get in touch with the feelings, thoughts and experiences that need to be worked through, or the child does not have a relationship with an adult who can do the holding, thinking and containing. All the psychotherapists and analysts in this book attempt to provide relationships that both contain and understand the child's experiences (in individual or group settings) on the one hand and facilitate emotional and psychological development on the other. I was surprised how again and again in each therapeutic relationship, the 'violent child' emerged (when he or she felt safe, contained and understood enough) as a highly sensitive, extremely vulnerable and particularly frightened child who was able to move at times quickly and at times slowly, from being dominated by destructive states of mind and experience to surrendering to pointedly beautiful and creative playful experiences. Helping a child to return to creative forms of play and communication is vital to the process of helping the child who harms. Research indicates that this essential process of change and development does not happen however by excluding, judging, reprimanding or punishing a child who becomes involved in violent acts or behaviours. Usually these methods only reinforce, placate or enrage the destructive behaviour and even at times make the behaviour worse. If however, a child is excluded alongside being offered a therapeutic place for understanding, or if the latter is offered on its own, something very different begins to emerge. You will read about many of these different emergent patterns of behaviour and emotional experience in this book. While we still have a lot to learn about the different methods that do actually work for helping the child that harms, this important book is based upon essential psychotherapeutic knowledge and processes that do actually work while also including those that do not work. Understanding and applying the knowledge is the challenge that faces any professional or non- professional person who attempts to help these vulnerable children who are often experiencing very painful, disconnected states of mind and body. Donald Campbell writes in the foreword to this book that, 'This is a rare book. Although much has been written from a psychoanalytic point of view about aggression, very little has been written about violence, and even less about violent children. This book goes some way to redressing that imbalance'. Campbell writes about the resistance we all may have to thinking about violence and also describes some problems encountered while undertaking psychotherapy with children who harm. Campbell also addresses the reality of the physical pain that may be experienced during the process of therapy. Campbell writes that, 'Violent children hunger for a real response to their aggression that recognizes them as distinct and separate. They are yearning for a reaction that takes them into account without negating them or retaliating, but one that is reparative in the way that understanding can be. The therapist's real but non-retaliatory reaction to being hurt is the beginning of a new experience for children who often experience others as reacting intrusively or by withdrawing'. The WHO report on violence and health (2002) highlights the fact that 'Violence by young people is one of the most visible forms of violence in society' (WHO report on Violence and Health, 2002: 25) and Karr-Morse and Wiley (1997) confirm that within the United States, children are found to be the fastest growing section of the criminal population. The role played by the broadcast media and newspapers, that highlight youth violence daily, make this form of violence more visible to us. Fonagy (2004b, 2005) in the conclusion to his chapter, 'Early Life Trauma and the Psychogenesis and Prevention of Violence' (re- published in this volume) proposes that it is both the 'glamourisation and the demonisation of violence' that actually prevents us from understanding the violent mind. Fonagy (2004b, 2005) further proposes the need to enter into the subjective world of the violent person, so that we may facilitate an understanding that helps us in both our preventative and our therapeutic/treatment measures. I write in the introduction to The Violent Child, about various aspects of violence and the attendant emotional, psychological, biological and social features that may be found to accompany these states in children. It highlights the importance of prevention and early intervention and the implicit use of therapy to help children who are in these vulnerable and dangerous states of mind and body. Interdisciplinary research is also advocated as a research tool to help us to obtain as complete an understanding as possible of violence and it's vicissitudes in children. All of the clinicians who have written chapters in this book, have entered very deeply into the complex and multi- layered subjective world of the violent child or children, and have written about these therapeutic processes here. All of the clinicians have begun their psychotherapeutic work from the same central starting point - that of attempting to understand the child, infant or children who have been identified as 'violent'. What we see, when their subjective world has been entered, is that beneath the violence lies extreme vulnerability and need. 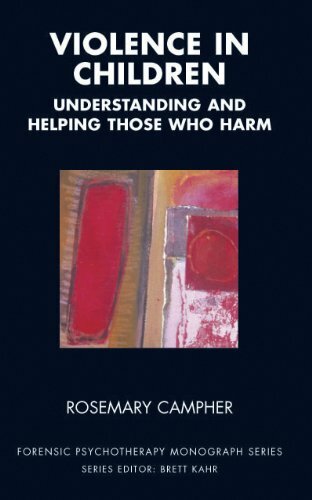 Reading, understanding and applying the knowledge that is contained with this timely book on how to help the child that harms is essential reading for anyone who is interested in helping these important children lead more fulfilling lives- from parents, teachers, social workers, psychotherapists, analysts, doctors and politicians.